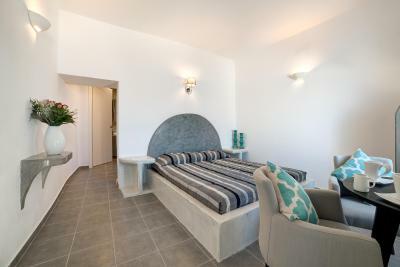 Lock in a great price for Remvi Suites – rated 9.5 by recent guests! 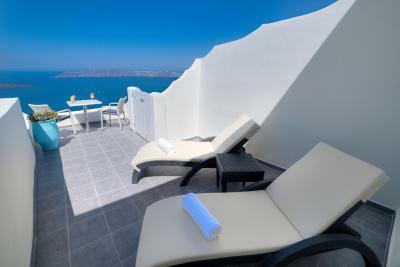 Remvi Suites is in a perfect location with an amazing view. 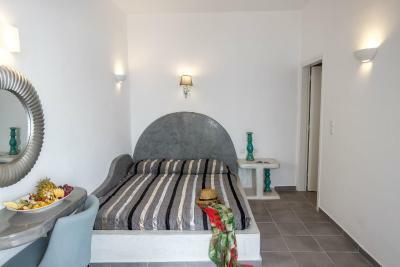 The room was clean, confterable and had a great private balcony. Tassan was a wonderful host! The beakfast was a fantastic and great way to start the day! There is no doubt we will stay at this place again. I completely recommend it! 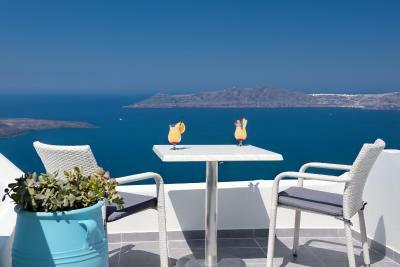 We had unit 102 which had spacious terrace with gorgeous views of Santorini and the Mediterranean. 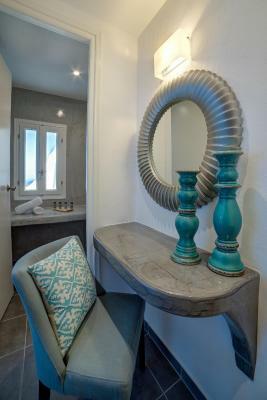 Unit was spacious and manager, Mr. Tasso, was helpful with arranging transfers to/from the ferry port. Set breakfast at Remvi restaurant was adequate with very nice, friendly waiters. We loved the privacy of the room and patio. Also the views were spectacular of course. Lastly. The breakfast was really great! Overall despite the few things I mentioned above, we really enjoyed ourselves there and the assistant manager who checked us in was very welcoming. We would recommend it. we had a great great stay in remvi. Everything was perfect. Staff were so kind and helpful.incredible view!! we'll back for sure! 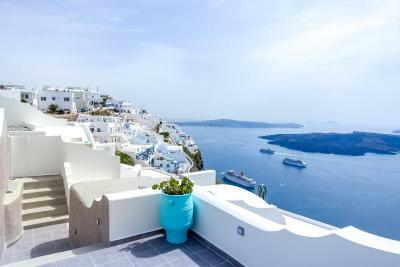 Rooms great, clean, great view , good location , but biggest thanks to Tasos who took care of us from arrival till departure with a great heart and professional all the time. 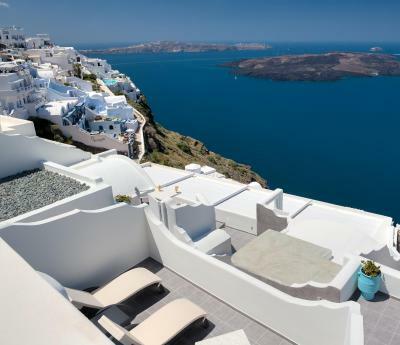 One of our top picks in Firostefani.Located in Firostefani, one of the most beautiful spots of the famous Santorini cliffs, Remvi Suites offers panoramic views to the volcano, the caldera and the Aegean Sea. 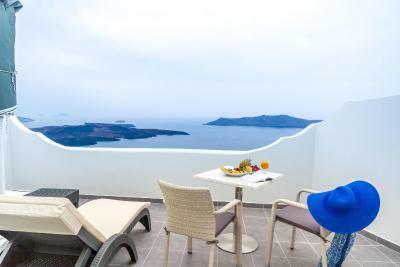 Opening to private verandas, all spacious and tastefully decorated guestrooms offer air conditioning, and are equipped with satellite TV and balcony with a view to the volcano. 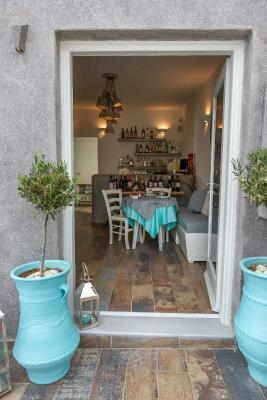 The hotel’s Cafe-Restaurant Remvi, located next to the rooms, serves local cuisine. 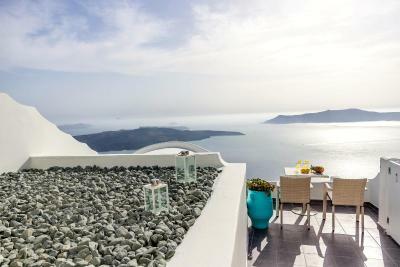 Breakfast is also served at the hotel’s restaurant, overlooking the volcano. The Monastery of Hozoviotissa is 2.1 mi away. 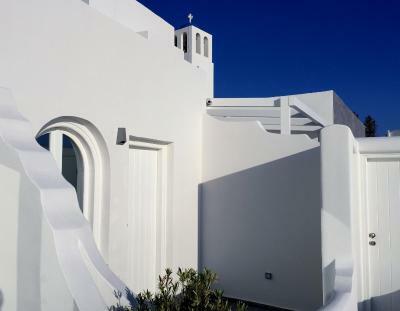 The nearest airport is Thira Airport, 3.1 mi from the property. 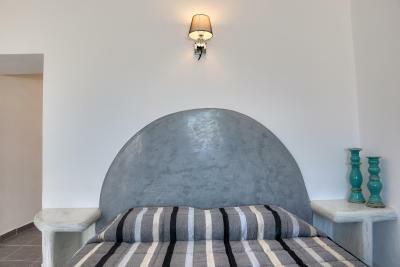 When would you like to stay at Remvi Suites? 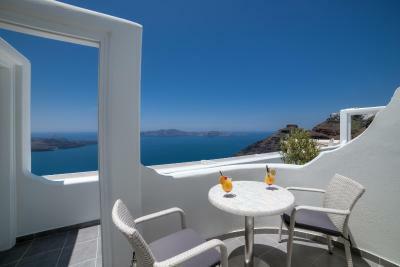 This room features a balcony or a patio with views of Caldera and the Aegean Sea. It includes air conditioning, fridge and satellite TV. 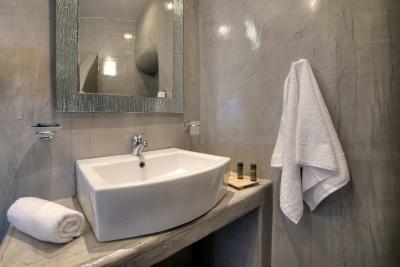 The private bathroom is stocked with a hairdryer. 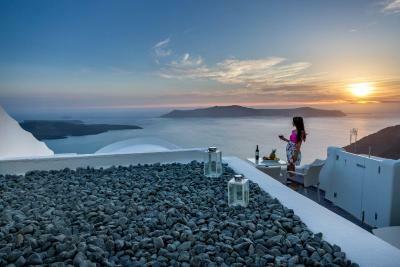 Offering views over the volcano and the caldera, this suite includes air conditioning, a mini-bar and a flat-screen TV. 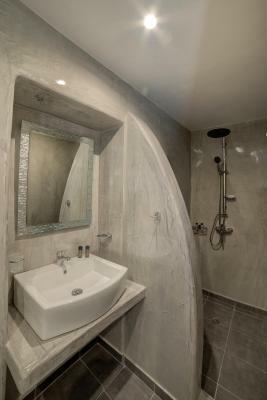 The private bathroom is stocked with a hairdryer and shower. House Rules Remvi Suites takes special requests – add in the next step! Remvi Suites accepts these cards and reserves the right to temporarily hold an amount prior to arrival. Hotel Manager was amazing and so attentive to everything we could need. It was very awesome everything!! Best experience in my life and beautiful honeymoon. All staff were vey kind and helpful. Restaurant was so wonderful and deliciouse! Nice breakfast. Nice view and clean room!! 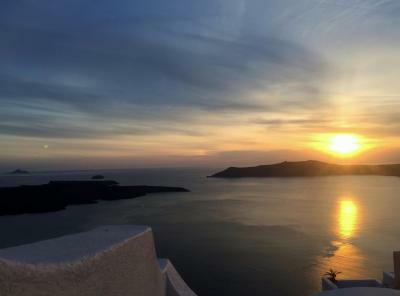 I am so thankful for the staff and i had a wonderful trip in Santorini. The view from our balcony was amazing. The location was very central but not too busy or touristy. The breakfast was exquisite, offering lots of different options with another amazing view. We didn’t have to think or plan much as all the options and advice was given to us by the staff. The breakfast was exactly the same every day. Caldera view.Its very central location. Lots of good places to eat in the vicinity. And an extremely knowledgeable and hospitable manager "Tasos". He gave us a guided map tour of the island. 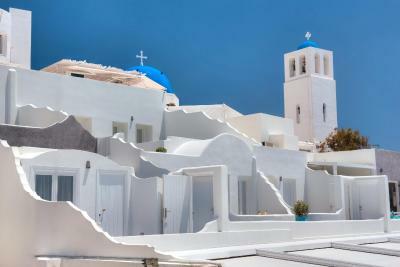 Informed us about the top spots and the best timings during the day to visit those attractions. He is the hidden gem of Remvi Suites. 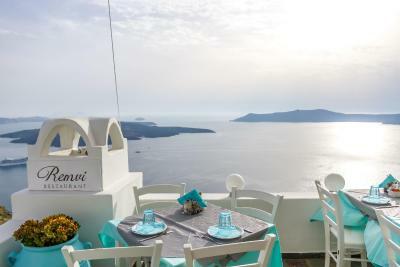 The breakfast was delicious and is very elegantly served, many different breads and croissants, choice of how you'd like your eggs cooked with a phenomenal view. I also loved how the hotel is tucked away on the street, and you enter through a very non descript side door into your very own private suite with a million $ view! Rain came through the door and window. But thank to prompt caring about it. Not good breakafast as I expected from the rate of the hotel. 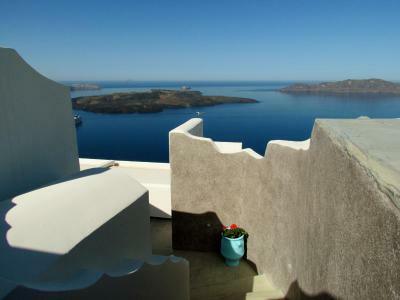 Good location and sea view with caldera. Very kind explanation about the attractivenesses worth to visit. 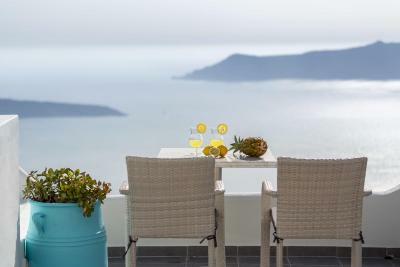 Good hotel restaurant with good seaview and delicious foods. Room 101 .... lovely room but very noisy from restaurant above!!!! People staying in rooms below have to enter and walk pass your room ... sometimes not all guests are respectful of noise!!! !